Rufus 3.0 is out; the new version of the popular utility for Windows is one of the easiest options on PCs running Windows to create bootable USB devices using ISO images. I used Rufus for a long time to create USB installation media for Linux or Windows, but did not review the software before 2017 here on this site. You can check out the Rufus review here for a general overview of the program’s functionality. While you may use other programs to create bootable media from ISO images, the Windows Media Creation Tool by Microsoft or Woe USB for Linux for instance, it is more often than not Rufus that I rely on for the job. You can throw nearly any ISO at Rufus and create bootable media using it with just a few clicks in the program interface. Rufus 3.0 is still super-easy to use; one core difference to previous versions of Rufus is that the new version is no longer compatible with Windows XP or Windows Vista. Users and admins who run these Windows versions need to stay on the previous version of the application as it is fully compatible with those operating systems. The interface of Rufus changed quite a bit in the new version to better highlight the “flow of user operations”. Drive Properties include an option to show advanced properties; most users don’t need these probably but they may be useful for advanced use scenarios. 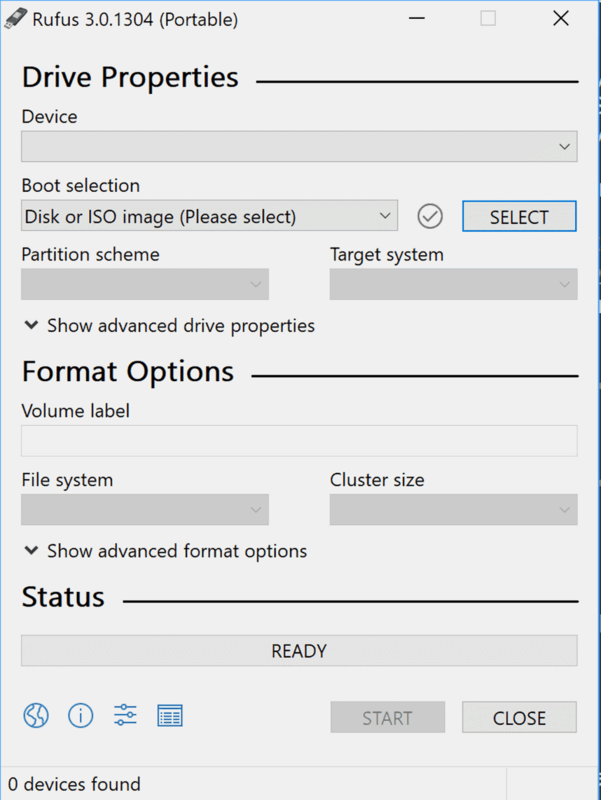 You may use the options to list all USB hard drives, add fixes for old BIOSes, or use the Rufus MBR with BIOS ID. Format Options define the file format and other properties of the drive the ISO image is created on. It includes volume label, file system, and cluster size information by default. Some options are hidden by default; you may disable quick format, created extended label and icon files, or check the device for bad blocks and select the number of passes. Rufus 3.0 includes other changes: it supports ARM64 for UEFI:NTFS, and comes with improved support for Linux ISO efi.img files, and non-ISO9660 compliant openSUSE Leap ISOs. The project website was switched to HTTPS so that all program downloads happen over HTTPS now. Rufus 3.0 is available as a portable version and version that can be installed. Windows XP and Vista users can download the previous version, Rufus 2.18, with a click on other downloads.